Small, Lightweight and dependable. 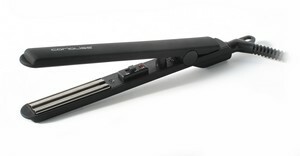 With ultra smooth Titanium plates technology for effortless glide. Create root lift, volume and movement with ease. Reach 200°C/395°F in less than 30 seconds. Negative ion technology eliminates frizz and static. Automatic Dual voltage circuitry for global travel. Perfect for touch ups,fringes and detailed root styling including male styling.